It was first discussed during the United Nations Conference on Trade and Employment and was the outcome of the failure of negotiating governments to create the International Trade Organization (ITO). GATT was signed by 23 nations in Geneva on 30 October 1947, and took effect on 1 January 1948. It remained in effect until the signature by 123 nations in Marrakesh on 14 April 1994, of the Uruguay Round Agreements, which established the World Trade Organization (WTO) on 1 January 1995. The WTO is a successor to GATT, and the original GATT text (GATT 1947) is still in effect under the WTO framework, subject to the modifications of GATT 1994. GATT, and its successor WTO, have successfully reduced tariffs. The average tariff levels for the major GATT participants were about 22% in 1947, but were 5% after the Uruguay Round in 1999. Experts attribute part of these tariff changes to GATT and the WTO. The second round took place in 1949 in Annecy, France. 13 countries took part in the round. The main focus of the talks was more tariff reductions, around 5,000 in total. The third round occurred in Torquay, England in 1951. Thirty-eight countries took part in the round. 8,700 tariff concessions were made totaling the remaining amount of tariffs to ¾ of the tariffs which were in effect in 1948. The contemporaneous rejection by the U.S. of the Havana Charter signified the establishment of the GATT as a governing world body. The fourth round returned to Geneva in 1955 and lasted until May 1956. Twenty-six countries took part in the round. $2.5 billion in tariffs were eliminated or reduced. The fifth round occurred once more in Geneva and lasted from 1960-1962. The talks were named after U.S. Treasury Secretary and former Under Secretary of State, Douglas Dillon, who first proposed the talks. Twenty-six countries took part in the round. Along with reducing over $4.9 billion in tariffs, it also yielded discussion relating to the creation of the European Economic Community (EEC). The sixth round of GATT multilateral trade negotiations, held from 1963 to 1967. It was named after U.S. President John F. Kennedy in recognition of his support for the reformulation of the United States trade agenda, which resulted in the Trade Expansion Act of 1962. This Act gave the President the widest-ever negotiating authority. As the Dillon Round went through the laborious process of item-by-item tariff negotiations, it became clear, long before the Round ended, that a more comprehensive approach was needed to deal with the emerging challenges resulting from the formation of the European Economic Community (EEC) and EFTA, as well as Europe's re-emergence as a significant international trader more generally. Japan's high economic growth rate portended the major role it would play later as an exporter, but the focal point of the Kennedy Round always was the United States-EEC relationship. Indeed, there was an influential American view that saw what became the Kennedy Round as the start of a transatlantic partnership that might ultimately lead to a transatlantic economic community. To an extent, this view was shared in Europe, but the process of European unification created its own stresses under which the Kennedy Round at times became a secondary focus for the EEC. An example of this was the French veto in January 1963, before the round had even started, on membership by the United Kingdom. Another was the internal crisis of 1965, which ended in the Luxembourg Compromise. Preparations for the new round were immediately overshadowed by the Chicken War, an early sign of the impact variable levies under the Common Agricultural Policy would eventually have. Some participants in the Round had been concerned that the convening of UNCTAD, scheduled for 1964, would result in further complications, but its impact on the actual negotiations was minimal. Measures for access to markets for agricultural and other primary products. The working hypothesis for the tariff negotiations was a linear tariff cut of 50% with the smallest number of exceptions. A drawn-out argument developed about the trade effects a uniform linear cut would have on the dispersed rates (low and high tariffs quite far apart) of the United States as compared to the much more concentrated rates of the EEC which also tended to be in the lower held of United States tariff rates. The EEC accordingly argued for an evening-out or harmonization of peaks and troughs through its cerement, double cart and thirty: ten proposals. Once negotiations had been joined, the lofty working hypothesis was soon undermined. The special-structure countries (Australia, Canada, New Zealand and South Africa), so called because their exports were dominated by raw materials and other primary commodities, negotiated their tariff reductions entirely through the item-by-item method. In the end, the result was an average 35% reduction in tariffs, except for textiles, chemicals, steel and other sensitive products; plus a 15% to 18% reduction in tariffs for agricultural and food products. In addition, the negotiations on chemicals led to a provisional agreement on the abolition of the American Selling Price (ASP). This was a method of valuing some chemicals used by the noted States for the imposition of import duties which gave domestic manufacturers a much higher level of protection than the tariff schedule indicated. However, this part of the outcome was disallowed by Congress, and the American Selling Price was not abolished until Congress adopted the results of the Tokyo Round. The results on agriculture overall were poor. The most notable achievement was agreement on a Memorandum of Agreement on Basic Elements for the Negotiation of a World Grants Arrangement, which eventually was rolled into a new International Grains Arrangement. The EEC claimed that for it the main result of the negotiations on agriculture was that they "greatly helped to define its own common policy". The developing countries, who played a minor role throughout the negotiations in this round, benefited nonetheless from substantial tariff cuts particularly in non-agricultural items of interest to them. Their main achievement at the time, however, was seen to be the adoption of Part IV of the GATT, which absolved them from according reciprocity to developed countries in trade negotiations. In the view of many developing countries, this was a direct result of the call at UNCTAD I for a better trade deal for them. There has been argument ever since whether this symbolic gesture was a victory for them, or whether it ensured their exclusion in the future from meaningful participation in the multilateral trading system. On the other hand, there was no doubt that the extension of the Long-Term Arrangement Regarding International Trade in Cotton Textiles, which later became the Multi-Fiber Arrangement, for three years until 1970 led to the longer-term impairment of export opportunities for developing countries. Another outcome of the Kennedy Round was the adoption of an Anti-dumping Code, which gave more precise guidance on the implementation of Article VI of the GATT. In particular, it sought to ensure speedy and fair investigations, and it imposed limits on the retrospective application of anti-dumping measures. Kennedy Round took place from 1962–1967. $40 billion in tariffs were eliminated or reduced. Reduced tariffs and established new regulations aimed at controlling the proliferation of non-tariff barriers and voluntary export restrictions. 102 countries took part in the round. Concessions were made on $19 billion worth. The Uruguay Round began in 1986. It was the most ambitious round to date, hoping to expand the competence of the GATT to important new areas such as services, capital, intellectual property, textiles, and agriculture. 123 countries took part in the round. The Uruguay Round was also the first set of multilateral trade negotiations in which developing countries had played an active role. Agriculture was essentially exempted from previous agreements as it was given special status in the areas of import quotas and export subsidies, with only mild caveats. However, by the time of the Uruguay round, many countries considered the exception of agriculture to be sufficiently glaring that they refused to sign a new deal without some movement on agricultural products. These fourteen countries came to be known as the "Cairns Group", and included mostly small and medium-sized agricultural exporters such as Australia, Brazil, Canada, Indonesia, and New Zealand. The Agreement on Agriculture of the Uruguay Round continues to be the most substantial trade liberalization agreement in agricultural products in the history of trade negotiations. The goals of the agreement were to improve market access for agricultural products, reduce domestic support of agriculture in the form of price-distorting subsidies and quotas, eliminate over time export subsidies on agricultural products and to harmonize to the extent possible sanitary and phytosanitary measures between member countries. In 1993, the GATT was updated (GATT 1994) to include new obligations upon its signatories. One of the most significant changes was the creation of the World Trade Organization (WTO). The 76 existing GATT members and the European Communities became the founding members of the WTO on 1 January 1995. The other 51 GATT members rejoined the WTO in the following two years (the last being Congo in 1997). Since the founding of the WTO, 33 new non-GATT members have joined and 22 are currently negotiating membership. There are a total of 164 member countries in the WTO, with Liberia and Afghanistan being the newest members as of 2018. Of the original GATT members, Syria, Lebanon and the SFR Yugoslavia have not rejoined the WTO. Since FR Yugoslavia,(renamed as Serbia and Montenegro and with membership negotiations later split in two), is not recognised as a direct SFRY successor state; therefore, its application is considered a new (non-GATT) one. The General Council of WTO, on 4 May 2010, agreed to establish a working party to examine the request of Syria for WTO membership. The contracting parties who founded the WTO ended official agreement of the "GATT 1947" terms on 31 December 1995. Montenegro became a member in 2012, while Serbia is in the decision stage of the negotiations and is expected to become a member of the WTO in the future. Whilst GATT was a set of rules agreed upon by nations, the WTO is an institutional body. As such, GATT was merely a forum for nations to discuss, while the WTO is a proper international organization (which implies physical headquarters, staff, delegation ...). The WTO expanded its scope from traded goods to include trade within the service sector and intellectual property rights. Although it was designed to serve multilateral agreements, during several rounds of GATT negotiations (particularly the Tokyo Round) plurilateral agreements created selective trading and caused fragmentation among members. WTO arrangements are generally a multilateral agreement settlement mechanism of GATT. The average tariff levels for the major GATT participants were about 22 percent in 1947. As a result of the first negotiating rounds, tariffs were reduced in the GATT core of the United States, United Kingdom, Canada, and Australia, relative to other contracting parties and non-GATT participants. By the Kennedy round (1962–67), the average tariff levels of GATT participants were about 15%. After the Uruguay Round, tariffs were under 5%. In addition to facilitating applied tariff reductions, the early GATT's contribution to trade liberalization "include binding the negotiated tariff reductions for an extended period (made more permanent in 1955), establishing the generality of nondiscrimination through most-favored nation (MFN) treatment and national treatment, ensuring increased transparency of trade policy measures, and providing a forum for future negotiations and for the peaceful resolution of bilateral disputes. All of these elements contributed to the rationalization of trade policy and the reduction of trade barriers and policy uncertainty." ^ a b c d e f Bown, Chad P.; Irwin, Douglas A. (December 2015). "The GATT's Starting Point: Tariff Levels circa 1947". NBER Working Paper No. 21782. doi:10.3386/w21782. ^ Tomz, Michael; Goldstein, Judith L; Rivers, Douglas (2007). "Do We Really Know That the WTO Increases Trade? Comment". American Economic Review. 97 (5): 2005–2018. doi:10.1257/aer.97.5.2005. ISSN 0002-8282. ^ Goldstein, Judith L.; Rivers, Douglas; Tomz, Michael (2007). "Institutions in International Relations: Understanding the Effects of the GATT and the WTO on World Trade". International Organization. 61 (1): 37–67. doi:10.1017/S0020818307070014. ISSN 1531-5088. ^ a b Irwin, Douglas A. (9 April 2007). "GATT Turns 60". Wall Street Journal. ISSN 0099-9660. Retrieved 28 October 2017. ^ "WTO | Understanding the WTO - The GATT years: from Havana to Marrakesh". www.wto.org. Retrieved 6 July 2017. ^ Michael Hudson, Super Imperialism: The Origin and Fundamentals of U.S. World Dominance, 2nd ed. (London and Sterling, VA: Pluto Press, 2003), 258. ^ "The GATT Uruguay Round". ODI briefing paper. Overseas Development Institute. Archived from the original on 3 August 2012. Retrieved 28 June 2011. ^ "Fiftieth Anniversary GATT". Wto.org. Retrieved 16 August 2013. ^ "Understanding the WTO - members". WTO. Retrieved 16 August 2013. ^ "Withdrawal of the Government of the Lebanon" (PDF). Wto.org. Retrieved 20 February 2019. ^ "Accession status: Syrian Arab Republic". WTO. Retrieved 16 August 2013. ^ "2010 News items – Working party established on Syria's membership request". WTO. Retrieved 16 August 2013. Alejandro Jara (born 1949 in Santiago, Chile) was a Deputy Director-General of the World Trade Organization (WTO). He served in this position from 2005 to 2013. His career began in 1976 when he joined the Foreign Service of Chile to primarily focus on international economic relations. From 1979 to 1984, he served in the Delegation of Chile to the General Agreement on Tariffs and Trade (GATT) and was seconded to the Economic System for Latin America (SELA) in Caracas as Coordinator for Trade Policy Affairs. He was appointed Director for Bilateral Economic Affairs in 1993 and Director for Multilateral Economic Affairs in 1994. From 1996 to 1997, he was also Chile's senior official to the Asia-Pacific Economic Cooperation (APEC) and Deputy Chief Negotiator for the Chile-Canada Free Trade Agreement and Chile-Mexico Free Trade Agreement. In 1999, he was designated Director General for International Economic Relations. He was appointed in 2000 as Ambassador, Permanent Representative of Chile to the World Trade Organization in Geneva. From 2000 to 2005 he held various diplomatic and ministerial positions, including Chairperson of the Committee on Trade and Environment of the WTO in 2001 and Chairman of the Special Session of the Council for Trade in Services in 2002. He's written a variety of papers on international trade. Arthur Dunkel (26 August 1932 – 8 June 2005) was a Swiss (Portuguese-born) administrator. He served as director-general of General Agreement on Tariffs and Trade between 1980 and 1993. Dunkel was educated at the Graduate Institute of International Studies, in Geneva. He was Professor for international trade at the University of Fribourg (Switzerland). Arthur Dunkel took an active part in the Uruguay Round Negotiations of the GATT. His contribution to the successful completion of these negotiations was vital. When negotiations had passed the deadline and no agreement had emerged he took initiative in his own hands compiling the 'Dunkel Draft' in December 1991. The draft put together the results of negotiations and provided an arbitrated solution to issues on which negotiators failed to agree. Even though the United States and India continued to bargain for changes to the Dunkel Draft, only minor amendments were made in the sphere of agriculture. The Dunkel Draft was accepted and became the foundation of the World Trade Organization. export to the offending country. Cultural exception (French: l'exception culturelle) is a political concept introduced by France in General Agreement on Tariffs and Trade (GATT) negotiations in 1993 to treat culture differently from other commercial products. In other words, its purpose is to consider cultural goods and services as exceptions in international treaties and agreements especially with the World Trade Organization (WTO). Its goals are to point out that States are sovereign as far as limitation of culture free trade is concerned in order to protect and promote their artists and other elements of their culture. Concretely, it can be seen through protectionist measures limiting the diffusion of foreign artistic work (quotas) or through subventions distributed according to the country cultural policy. The Director-General of the General Agreement on Tariffs and Trade was responsible for supervising the administrative functions of the General Agreement on Tariffs and Trade (GATT). The first Director-General, Eric Wyndham White, was appointed on March 23, 1965. GATT had a total of 5 Director-Generals until the WTO was formed in 1995. Peter Sutherland was the last Director-General of GATT, and the first of the WTO. The Director-General of the World Trade Organization is responsible for supervising the administrative functions of the World Trade Organization (WTO). Because World Trade Organizations' decisions are made by member states (through either a Ministerial Conference or through the General Council), the Director-General has little power over matters of policy - the role is primarily advisory and managerial. The Director-General supervises the WTO secretariat of about 700 staff and is appointed by WTO members for a term of four years.The current Director-General is Roberto Azevêdo of Brazil, since 1 September 2013.Before the creation of the WTO, the General Agreement on Tariffs and Trade had a series of Directors-General. Peter Sutherland was the last DG of GATT and the first of the WTO. In 1979, as part of the Tokyo Round of the General Agreement on Tariffs and Trade (GATT), the enabling clause was adopted in order to permit trading preferences targeted at developing and least developed countries which would otherwise violate Article I of the GATT. Paragraph 2(a) provides a legal basis for extending the Generalized System of Preferences (GSP) beyond the original 10 years. In practice it gave a permanent validity to the GSP. The enabling clause permits developed countries to discriminate between different categories of trading partners (in particular, between developed, developing and least developed countries) which would otherwise violate Article I of the GATT which stipulates that no GATT contracting party must be treated worse than any other (this is known as most favoured nation treatment). In effect, this allows developed countries to give preferential treatment to poorer countries, particularly to least developed countries. Paragraph 2(c) permits developing countries to enter into preferential trade agreements which do not meet the strict criteria laid out in GATT Article XXIV for regional free-trade agreements. It allows developing countries to enter into agreements which may be non-reciprocal, or cover a very limited range of products (which would otherwise contravene the GATT). Sir Eric Wyndham White KCMG (1913–1980) was a British administrator and economist. He was founder and first executive secretary of the General Agreement on Tariffs and Trade between 1948 and 1965. He was the first director-general of General Agreement on Tariffs and Trade from 1965 to 1968. Born on 26 January 1913, White was educated at the Westminster City School and the London School of Economics. He graduated as a LLB with first class honours and in 1938 was called to the bar by the Middle Temple. He was an assistant lecturer at the LSE until the Second World War started when he moved to the Ministry of Economic Warfare. In 1942 he became the First Secretary at the British Embassy in Washington.In 1945 he became Special Assistant to the European Director of the United Nations Relief and Rehabilitation Administration. He became involved in the forming of a secretariat for a new international trade organisation, the General Agreement on Tariffs and Trade in 1948 and became the first Director-General.White died aged 67 on 27 January 1980 in France after suffering a heart attack while swimming. This is a list of international trade topics. The International Trade Organization (ITO) was the proposed name for an international institution for the regulation of trade. Led by the United States in collaboration with allies, the effort to form the organization from 1945 to 1948, with the successful passing of the Havana Charter, eventually failed due to lack of approval by the US Congress. 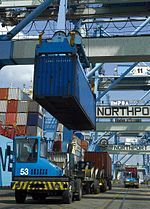 Until the creation of the World Trade Organization in 1994, international trade was managed through the General Agreement on Tariffs and Trade (GATT). The Marrakesh Agreement, manifested by the Marrakesh Declaration, was an agreement signed in Marrakesh, Morocco, by 124 nations on 15 April 1994, marking the culmination of the 8-year-long Uruguay Round and establishing the World Trade Organization, which officially came into being on 1 January 1995.The agreement developed out of the General Agreement on Tariffs and Trade (GATT), supplemented by a number of other agreements on issues including trade in services, sanitary and phytosanitary measures, trade-related aspects of intellectual property and technical barriers to trade. It also established a new, more efficient and legally binding means of dispute resolution. The various agreements which make up the Marrakesh Agreement combine as an indivisible whole; no entity can be party to any one agreement without being party to them all. Olivier Long (October 11, 1915 – March 19, 2003) was a Swiss Ambassador and the director-general of the General Agreement on Tariffs and Trade from May 6, 1968 to October 1, 1980. Mr. Long was born at Petit-Veyrier, Switzerland, near Geneva, on Oct. 11, 1915. Besides having studied in London and Harvard, he had a Doctor of Laws from the University of Paris and Doctor of Political Science from the University of Geneva and the Graduate Institute of International Studies. After military service in 1939-43, he joined the International Committee of the Red Cross (ICRC) and traveled across wartime Europe, negotiating prisoner-of-war exchanges and food relief assistance. After the war, he joined the Swiss federal government, and after service in Washington and London he began to work on trade issues as the director general of the General Agreement on Tariffs and Trade. Mr. Long helped keep the Western world moving toward freer trade in the 1970s despite protectionist pressures brought on by soaring oil prices, inflation and recession. As director general of the General Agreement on Tariffs and Trade from 1968 to 1980, Mr. Long helped to bring about the largest reductions in tariffs since World War II. GATT, an organization based in Geneva, was created in 1948 to oversee international trade. Mr. Long was the second director general of GATT, taking over from Eric Wyndham White, who had run the organization for the first 20 years of its existence. At first he was reluctant to take the job, since doing so meant giving up his post as Switzerland's ambassador to Britain and Malta, which he had accepted in 1967. Representatives of the leading industrial nations met at a 1973 summit meeting in Tokyo, setting off a six-year free-trade effort that became known as the Tokyo Round. These were difficult years for proponents of free trade. When oil prices quadrupled at the end of 1973—a consequence of actions by the Organization of the Petroleum Exporting Countries—the twin shocks of recession and inflation rippled through the world economy. National currencies became exceptionally unstable. Industries everywhere pleaded with their governments for protection against foreign competitors. Yet Mr. Long managed to hold the world's democratic industrial governments, as well as some 20 developing countries, to the free trade commitments they had made at the start of negotiations. Not only did many tariffs drop, the Tokyo Round also represented the most comprehensive effort until then to eliminate or control other sorts of trade barriers, like quotas and export subsidies. In 1995, at the conclusion of another trade-liberalizing exercise known as the Uruguay Round, GATT's role in governing world commerce was assumed by the World Trade Organization, a new and more powerful institution. Because of his close personal ties with many leading French politicians Mr. Long became an intermediary between Charles de Gaulle's government in Paris and the Algerian National Liberation Front. He helped set up the talks that eventually led to the Evian agreements of 1962, which ended the Algerian war. Mr. Long returned to commercial diplomacy, playing a prominent role in negotiations that led to creation of the European Free Trade Association, a trading bloc set up in 1959 by seven European countries that did not wish to join the six-nation European Community, or Common Market. Mr. Long was also a Professor at the Graduate Institute of International Studies in Geneva. He was the author of several books and articles on economic affairs and political science. He is survived by his wife, the former Francine Roels, whom he married in 1946, and by two daughters and a son, Dr. Eric Long . The Ambassador and Permanent Representative of Australia to the World Trade Organization is an officer of the Australian Department of Foreign Affairs and Trade and the head of the Permanent Mission of the Commonwealth of Australia to the World Trade Organization (WTO) in Geneva, Switzerland. The position has the rank and status of an Ambassador Extraordinary and Plenipotentiary and continues Australia's representation to the General Agreement on Tariffs and Trade (GATT; 1948–1995), as a charter member joining the WTO to replace the GATT on 1 January 1995. The Permanent Mission to the WTO is based with the Australian Permanent Mission and Consulate-General in Geneva. Prior to 1983, the role of Australia's representative on the GATT was filled by the Permanent Representative of Australia to the United Nations Office in Geneva. The Protocol on Trade Negotiations (PTN) is a preferential trade agreement signed on 9 December 1971 with the aim of increasing trade between developing countries in the framework of the General Agreement on Tariffs and Trade. Its entry into force was on 11 February 1973 and its notification to the WTO on 9 November 1971. Schedules of concessions are documents in which the specific commitments are listed. World Trade Organization (WTO) negotiations produce general rules that apply to all members, and specific commitments made by individual member governments. For trade in goods in general, these consist of maximum tariff levels. For agriculture they also include tariff quotas, limits on export subsidies, and some kinds of domestic support. The goods schedules are annexed to the General Agreement on Tariffs and Trade (GATT) and are “bound” (GATT Article II). The Uruguay Round Agreements Act (URAA; Pub.L. 103–465, 108 Stat. 4809, enacted December 8, 1994) is an Act of Congress in the United States that implemented in U.S. law the Marrakesh Agreement of 1994. The Marrakesh Agreement was part of the Uruguay Round of negotiations which transformed the General Agreement on Tariffs and Trade (GATT) into the World Trade Organization (WTO). One of its effects is to give United States copyright protection to some works that had previously been in the public domain in the United States.